To chant the Hare Krishna mantra. To hear and discuss Srimad-Bhagavatam. To offer services to the Deity at home or in the temple. To associate with the Lord’s devotees. 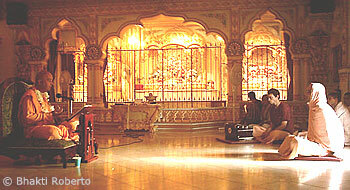 To live in a holy place connected to Lord Krishna. Chaitanya Mahaprabhu emphasized the primacy of these five principles while instructing Rupa Goswami, one of His chief disciples.